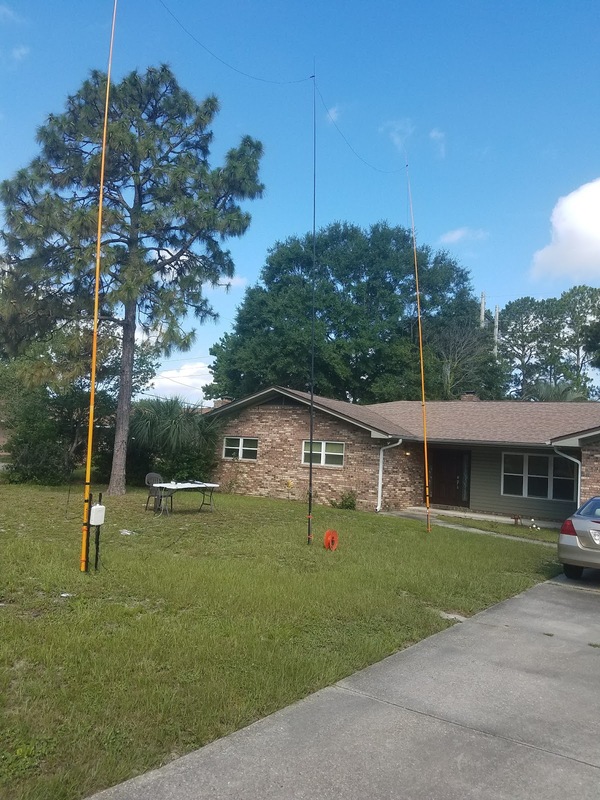 We used the call N4Y and our category was 1B in Northern Florida. Our site was at Falling Waters State Park in Northwest Florida. You may have noticed from my previous posts that I put extra effort into Field Day preparations this year. 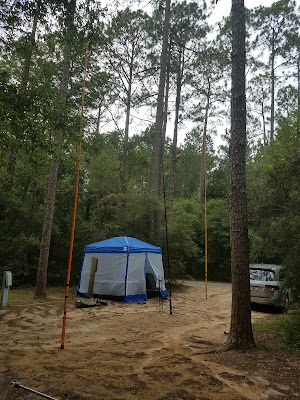 I came up with the loop antenna to fit the bounds of the camping site. I tested the loop several times in my yard. 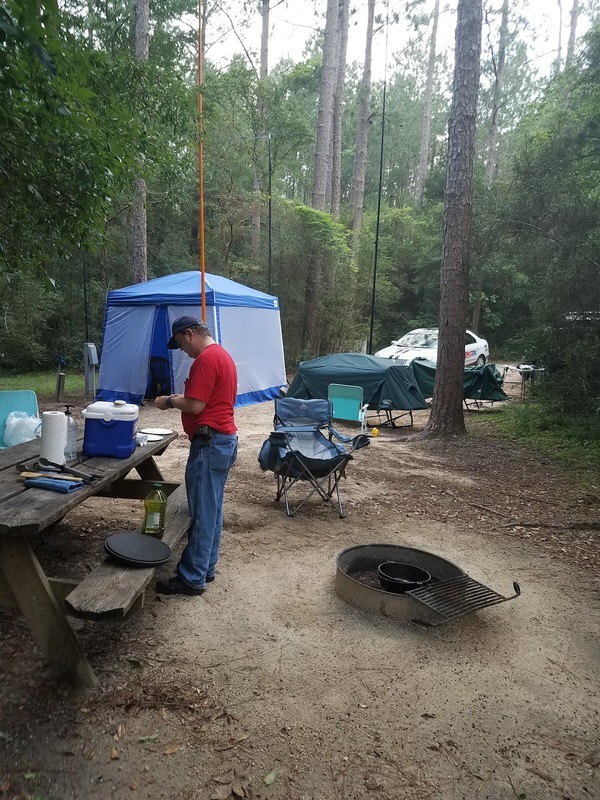 Then I went to the Falling Waters State Park campsite on June 2nd and did a dry run All that effort paid off on the actual Field day. I was worried about thunderstorms, but fortunately, the rain held off. The social side went well. Tom WD0HBR and wife Sandy who has a license visited Friday. Rick NZ2I came up on Friday night. 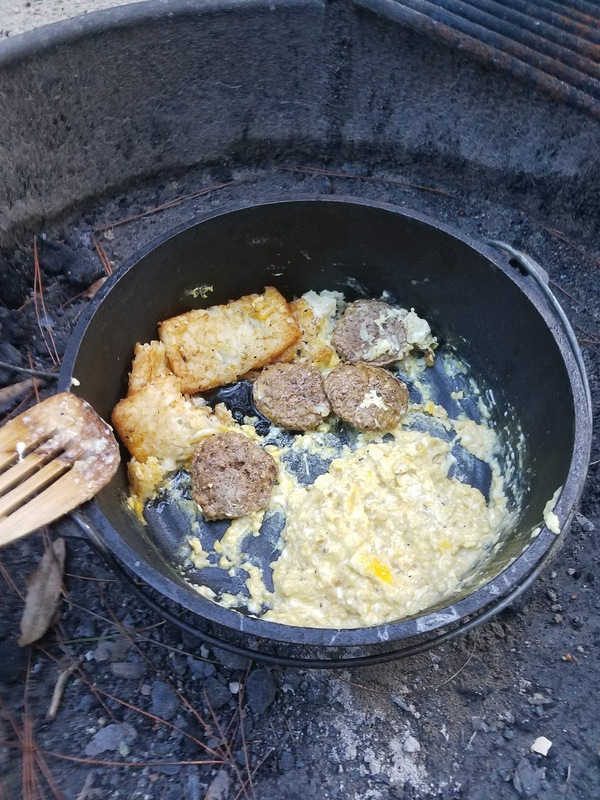 Rick made smores that night, cooked eggs for breakfast and venison chili for lunch on Saturday. My friend Dennis WA6QKN came up for a good visit on Saturday. Bob KK4DIV came up on Sunday and made a great video. Several of my visitors saw the falling waters namesake of the park. The recent rains had a significant stream to pouring into the sinkhole. Friday night we made a few contacts as a test. The Icom IC-7300 and the antenna were doing fine. 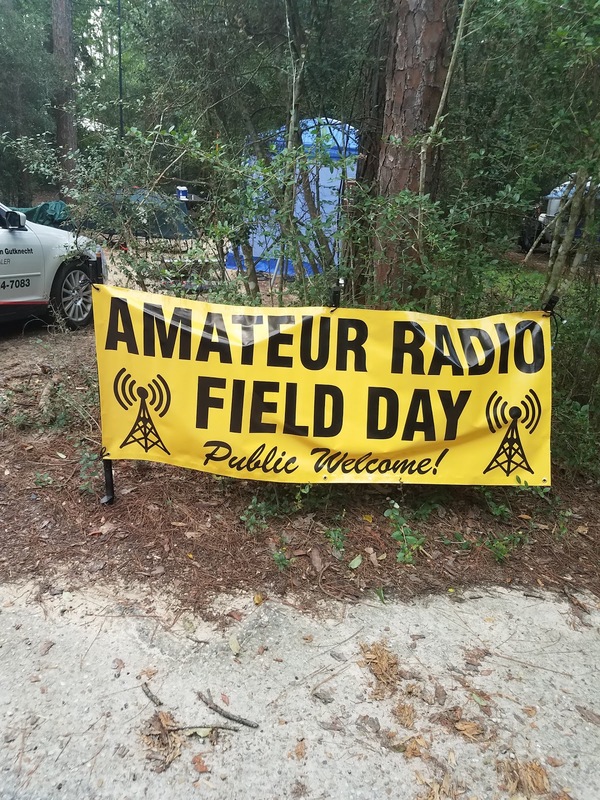 Saturday morning pre-Field Day, I could hear very little on 40 or 20 meters. Usually, the bands are buzzing on Saturday morning. I expected to pick up a few stations making test calls. I panicked. I rechecked everything and changed out some coax. I even put up a separate dipole to see if I could hear anything. I guess the world was on radio silence. The bands, fortunately, came alive at the start of Field Day. The excellent breakfast Rick prepared. I am a hunt and pounce operator. That worked well on 40 and 20 meters CW where the stations filled the IC-7300 spectrum scope. They came right back to my call. On SSB there was too much competition for each station calling CQ. It took some effort to snag one. So CW was more productive. Also, CW counts two points for each QSO versus one point for Phone. Rick and Dennis helped me log on Saturday. Rick passed 11 messages to Bob WB4BLX at the Bay County EOC. Those were worth a total of 200 bonus points. I was on my own Saturday Night. I turned in about 10 PM, and I got up at 5 AM. Sunday morning there was different propagation on 40 meters. I picked up several new sections. I was delighted to see that the 15 meters band was open also. I picked up more contacts there. Then I setup for the alternate energy bonus. I use a supercapacitor instead of a battery for energy storage. The rig was the Elecraft KX2. 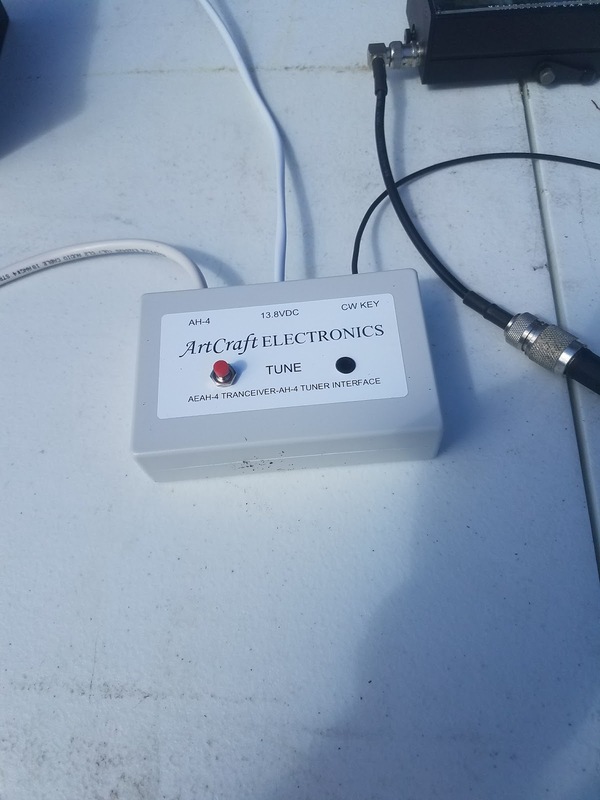 I adapted the KX2 to the AH-4 tuner and the loop using an Artcraft interface box. Since it was overcast, the solar panel charged the supercapacitor very slowly. So the K-Tor pedal generator came into play. Ten minutes of pedaling raised the voltage from 9 to 13 volts. I made four 20 meter CW contacts very quickly. The rig kicked down from ten to five watts as the voltage went down. After the fourth contact, the rig crashed at 9 volts. Bob KK4DIV manned the generator and charged the supercapacitor back up to 13 volts. I made the 5th contact. Each contact was 20 points for a total of 100 bonus points. Perhaps I should have been QRP the whole time. Everything was going to plan. I allocated two hours to tear down starting at 11 AM Sunday to make the 1 PM checkout time. Packing took every minute of it. The little part that went wrong was this. I was packing up the screen for the pop-up canopy. It is at least 40 feet long. I was stretching it out to fold it up. I said to myself; I will get this done. All of a sudden I fell and landed flat on my back. I had walked backward right over the fire ring I was lucky and had no injury. Good thing the fire ring was not hot! I finished packing and got out on schedule. The total contacts were 138, 120 on CW and 18 on phone. The total points were 258. I had 850 points for bonuses to include emergency power, alternate energy, public place, publicity, information table, social media, section manager message, and ten messages passed. Wow, this was fun! I plan to reserve the same campsite next year and possibly the adjacent one. I might entice a few more ops to join me. You can count on that I will be planning Field Day right up to the next one. I am a bit obsessive about Field Day but Why Not! In my teen ham years, I remember the local club dropped off a generator and left Field Day to four of us teenage hams. We knew how to string up some dipoles and did Field Day on our own. That does not seem to happen anymore. 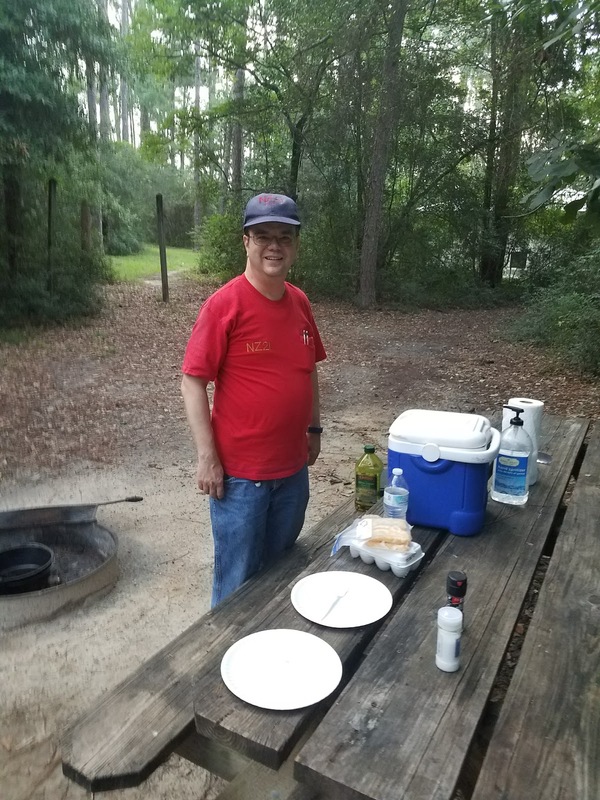 This year I will be doing Field Day at Falling Waters State Park near Chipley, Florida. I reserved the call N4Y for the event. I can't invite the general public to the camping area. However, we welcome all the campers. 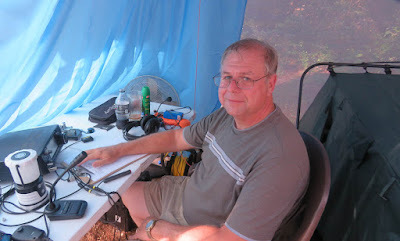 Prior to Field Day on Friday, I will operate as N4KGL and the contacts will count for KFF-1864 Parks On The Air. Friday night is informally known as QRP Night We will look for other groups participating on CW QRP frequencies. 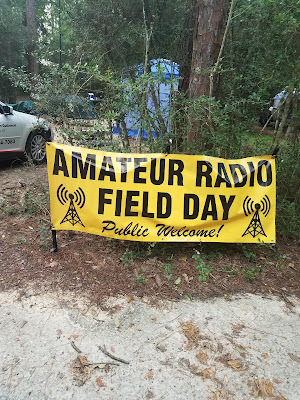 Our Field Day starts at 1800 UTC or 1 PM CDT Saturday. It is 24 hours but due to checkout time being 1 PM Sunday I will tear down at 11 AM. 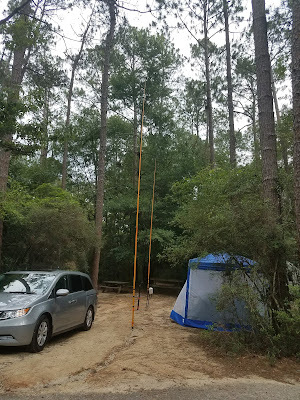 The rig will be my Icom 7300 and a 30 by 20 ft vertical loop. The bottom wire is 10 feet above the ground. It is fed at the bottom center with an AH-4 tuner. I have 100 AH of battery power and a solar panel. I also will have a rig on 2 meters and a 4 element yagi. Phone contacts count one point each. CW contacts count two points each. The power multiplier will be 2 X for less than 150 watts. I am bailing out on QRP this time. 100 points for being on on emergency power. I have us covered with 100 AH of batteries plus a solar power assist. 100 points for a public information table. 100 Points for Section Manager Message and up to 100 points for message handling. 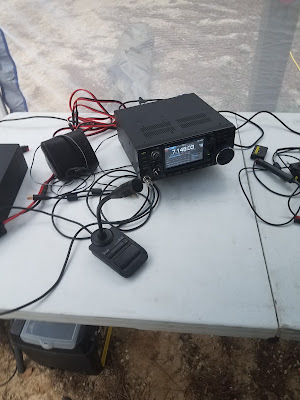 I am working with Phil N4STC to relay messages via 2-meter simplex. He will be Field Day Mobile. 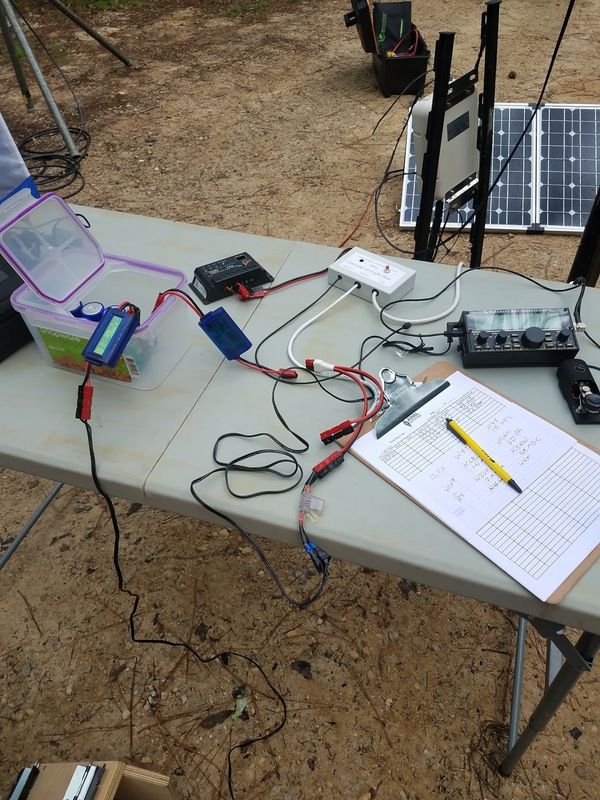 100 bonus points for Field Day groups making a minimum of five QSOs without using power from commercial mains or petroleum-driven generator. I can use the supercapacitor setup for this.We can charge it up with a human power generator or solar. 100 points for social media. I posted to the Google+ Field Day Community. 50 points for submitting via the web. The Panama City ARC will be at the Bay County EOC as usual operating with a the W4B callsign. 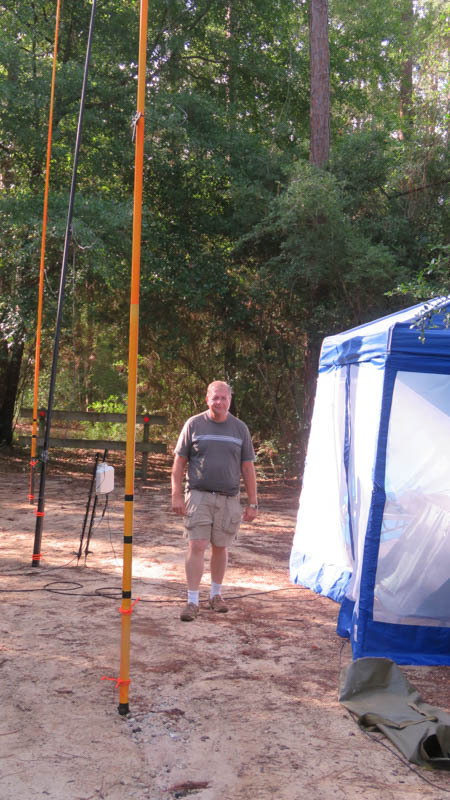 Phil N4STC of Panama City will be Field Day mobile. There will also be KE4FD operating in Bay County contact K4LIX Jim for info. Today was the Second Second Saturday Sprint for June. The SSS is sponsored by the Google+ QRP Field Ops Community and runs from May through October. 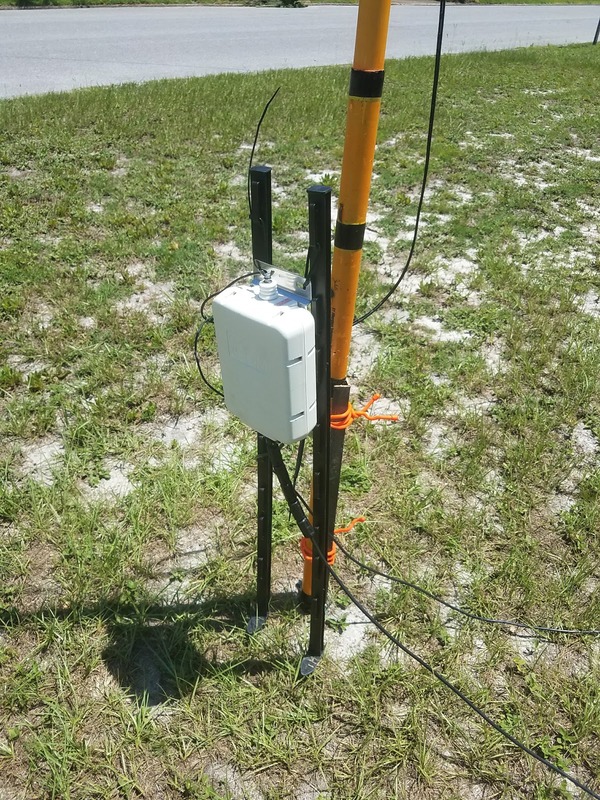 I decided to deploy the Field Day Loop in the front yard. I got out early and set it up. I captured the setup on video. I also used an ArtCraft AH4 Interface box successfully with the Icom AH-4. This allows me to initiate tuning of the AH-4 from the Elecraft KX2. 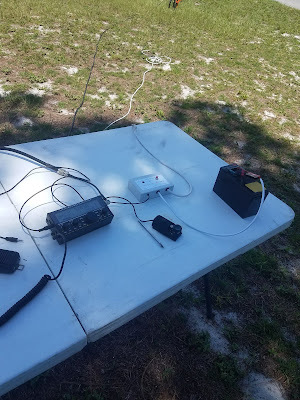 I took on a challenge today I chose to operate QRP. I also decided to feed the loop from the bottom corner for vertical polarization. I knew that was not the best idea for 40 meters. It was OK on 20 meters. It is preferred on 15 meters for the loop, but no signals heard on 15. I started on 40 CW and was glad to hear my friend Don KK4QAM in Sweetwater, Alabama. This was followed by local contacts with Mike KM4ELJ, Bob KK4DIV, and Don KK4DWC. Bob KK4DIV was set up at Under The Oaks Park about 12 miles away. Next was 20 CW, I had four SKCC contacts and one casual contact. I went to 2 meters and worked KK4DWC Don, N1HQ Jack, N4FA Charlie all on simplex. 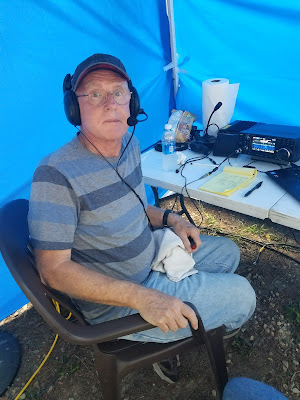 I rounded the two hours out with Jack N1HQ on 20 SSB. He lives on my street. 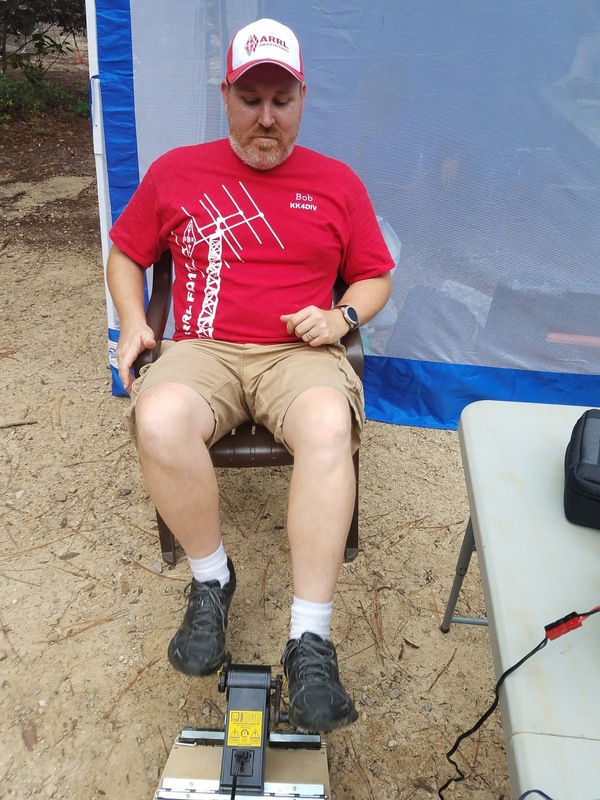 I was pleased to work N9XG doing SOTA on 40 CW and KJ4UHR on 40 SSB in Kentucky. It felt like the bands were weak, but I can't complain about a page of contacts. I will go back to feeding the loop at the bottom center for Field Day. But, I had to give the bottom corner feed a try. I will be setting up at Falling Waters State Park on Friday afternoon, June 23rd with the same antenna. That evening will be QRP Night. So basically I will be ready ahead of time. I can do some contacts for Parks On The Air Saturday morning. I will kick off Field Day using the call N4Y and category 1A. at 1800 UTC Saturday. 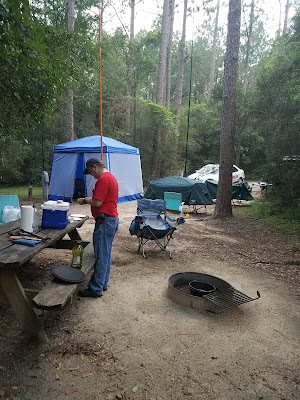 I did my first overnight camping trip at Falling Waters State Park Florida. This was a POTA activation for KFF-1864 and a dry run for Field Day 2017. I was at campsite 11 which will be the same campsite for Field Day. I was glad to see that the loop antenna fit well. I placed it in in the center of the pull-in area. 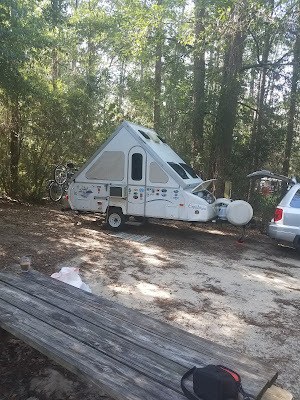 It did get the interest up of the neighboring campers. They came by for a chat and said they were quite impressed with the push-up process. Of course, they did not know what it was for until they asked. Doug my immediate campsite neighbor is going to put photos of the antenna on his travel blog. He and his wife Barbara travel in an A-shaped camping trailer. Doug says Linda and I could have lots of fun camping. I had a mix of contacts including working my friends in Panama City, POTA chasers, and museum ships. 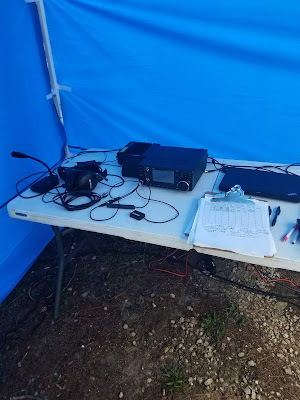 A highlight was working EA8ARI at EAFF-0079. This qualifies for WWFF Park to Park awards. I also worked KH6ZM in Hawaii on 40 meters CW. I had 56 contacts total. The antenna performed well for US and DX. I slept in the tent-cot I brought. It is an easy setup. Thanks to Rick NZ2I for the idea. The one test I did not get was enduring a downpour. It thinks it would disrupt operating. We will see what Field Day brings. I am real confident I have the right piece parts gathered. The Icom 7300 was a joy to operate. I will operate Field Day with a few friends. The callsign will be N4Y. I am ready to go.